August 10th, 2012 By: GGT Category: 2012/12 release, Figure News. 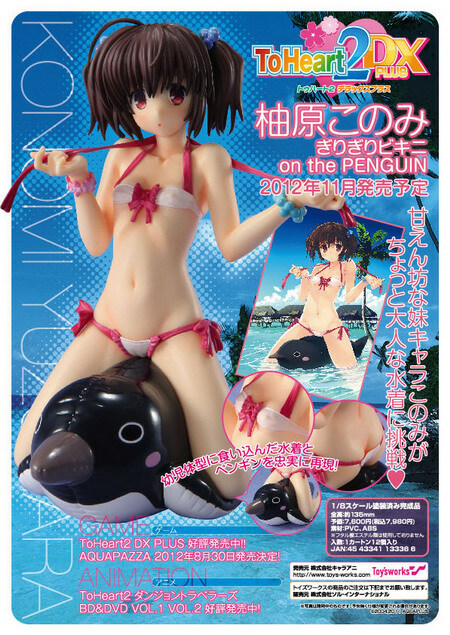 Toy’s works is going to release the Yuzuhara Konomi ( 柚原このみ ) GiriGiri Bikini on the PENGUIN ( ぎりぎりビキニ on the PENGUIN ) 1/8 PVC figure from the eroge and anime series “ToHeart2 DX Plus” published by AQUAPLUS. Will be released in December 2012. Around 135mm, 7,600 yen.